What is a SQL JOIN and what are different types? JOINS are way to query the data that combined together from multiple tables simultaneously. Equi-Join: Combines common records from two tables based on equality condition. Technically, Join made by using equality-operator (=) to compare values of Primary Key of one table and Foreign Key values of another table, hence result set includes common(matched) records from both tables. For implementation see INNER-JOIN. Non-Equi-Join: It is reverse of Equi-join where joining condition is uses other than equal operator(=) e.g, !=, <=, >=, >, < or BETWEEN etc. For implementation see INNER-JOIN. Self-Join:: A customized behavior of join where a table combined with itself; This is typically needed for querying self-referencing tables (or Unary relationship entity). For implementation see INNER-JOINs. Cartesian Product: It cross combines all records of both tables without any condition. Technically, it returns result set of a query without WHERE-Clause. As per SQL concern and advancement, there are 3-types of joins and all RDBMS joins can be achieved using these types of joins. INNER-JOIN: It merges(or combines) matched rows from two tables. The matching is done based on common columns of tables and their comparing operation. If equality based condition then: EQUI-JOIN performed, otherwise Non-EQUI-Join. **OUTER-JOIN:**It merges(or combines) matched rows from two tables and unmatched rows with NULL values. However, can customized selection of un-matched rows e.g, selecting unmatched row from first table or second table by sub-types: LEFT OUTER JOIN and RIGHT OUTER JOIN. 2.1. LEFT Outer JOIN (a.k.a, LEFT-JOIN): Returns matched rows form two tables and unmatched from LEFT table(i.e, first table) only. 2.2. RIGHT Outer JOIN (a.k.a, RIGHT-JOIN): Returns matched rows from two tables and unmatched from RIGHT table only. 2.3. FULL OUTER JOIN (a.k.a OUTER JOIN): Returns matched and unmatched from both tables. CROSS-JOIN: This join does not merges/combines instead it performs Cartesian product. 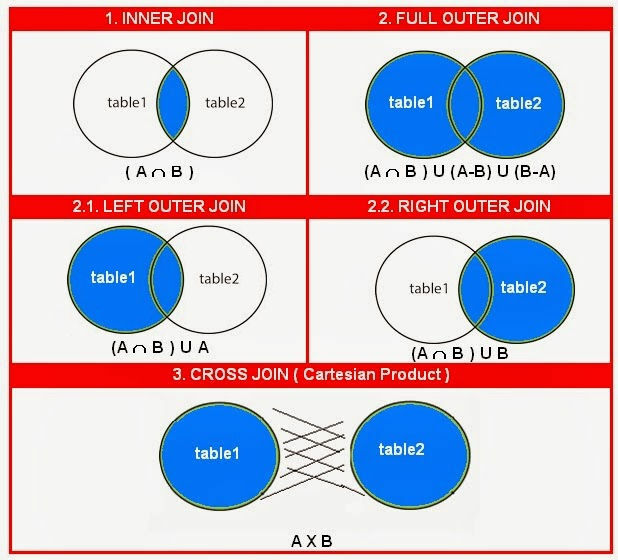 Note: Self-JOIN can be achieved by either INNER-JOIN, OUTER-JOIN and CROSS-JOIN based on requirement but table must join with itself. Labels "Table 1" & "Table 2" & the labels underneath are inappropriate, they are from illustrations of intersect/except/union; here the circles are the rows returned by left & right join, as the numbered labels say. The A X B picture is nonsense. cross join = inner join on 1=1 & is a special case of the first diagram. What is SQL JOIN ? SQL JOIN is a method to retrieve data from two or more database tables. What are the different SQL JOINs ? In this kind of a JOIN, we get all records that match the condition in both tables, and records in both tables that do not match are not reported. In other words, INNER JOIN is based on the single fact that: ONLY the matching entries in BOTH the tables SHOULD be listed. Note that a JOIN without any other JOIN keywords (like INNER, OUTER, LEFT, etc) is an INNER JOIN. In other words, JOIN is a Syntactic sugar for INNER JOIN (see: Difference between JOIN and INNER JOIN). Either, the matched rows from one table and all rows in the other table Or, all rows in all tables (it doesn't matter whether or not there is a match). This join returns all the rows from the left table in conjunction with the matching rows from the right table. If there are no columns matching in the right table, it returns NULL values. This JOIN returns all the rows from the right table in conjunction with the matching rows from the left table. If there are no columns matching in the left table, it returns NULL values. This JOIN combines LEFT OUTER JOIN and RIGHT OUTER JOIN. It returns rows from either table when the conditions are met and returns NULL value when there is no match. In other words, OUTER JOIN is based on the fact that: ONLY the matching entries in ONE OF the tables (RIGHT or LEFT) or BOTH of the tables(FULL) SHOULD be listed. Note that `OUTER JOIN` is a loosened form of `INNER JOIN`. the JOIN is made on all the columns with the same name for equality. Removes duplicate columns from the result. This seems to be more of theoretical in nature and as a result (probably) most DBMS don't even bother supporting this. It is the Cartesian product of the two tables involved. The result of a CROSS JOIN will not make sense in most of the situations. Moreover, we won't need this at all (or needs the least, to be precise). It is not a different form of JOIN, rather it is a JOIN (INNER, OUTER, etc) of a table to itself. For whatever JOIN type (INNER, OUTER, etc), if we use ONLY the equality operator (=), then we say that the JOIN is an EQUI JOIN. This is same as EQUI JOIN but it allows all other operators like >, <, >= etc. Many consider both EQUI JOIN and Theta JOIN similar to INNER, OUTER etc JOINs. But I strongly believe that its a mistake and makes the ideas vague. Because INNER JOIN, OUTER JOIN etc are all connected with the tables and their data whereas EQUI JOIN and THETA JOIN are only connected with the operators we use in the former. Again, there are many who consider NATURAL JOIN as some sort of "peculiar" EQUI JOIN. In fact, it is true, because of the first condition I mentioned for NATURAL JOIN. However, we don't have to restrict that simply to NATURAL JOINs alone. INNER JOINs, OUTER JOINs etc could be an EQUI JOIN too. While this seems reasonable, I don't think answers "what is an SQL join" in any way that conveys useful information. The answer as a whole is a reference written for people who already understand joins, not for the sorts of people who are asking those questions. It also omits references, both to support its claims (as is appropriate if making an authorative answer) and to provide additional explanation via external resources. If you're trying to write an authoritative answer to link new SQL users to, it might be worth filling in the blanks a bit, especially the "what is a join" part. @CraigRinger ARE YOU SERIOUS ? I'm going to push my pet peeve: the USING keyword. I find this very practical, readable, and not used often enough. This does not answer the question. It belongs as a comment either under the question or one of the answers. @Niraj The circles A & B do not contain the rows of A & B. They are blindly copied from elsewhere without credit. Cross join is included in the inner join case, it's inner join on 1=1. In what way are these parts of the picture "perfect"? @philipxy Sorry but I am not bothered about if it is copied from elsewhere. and I am not sure which is not correct in the above picture. for me this is ok. Cross join is not described here. It is not included in an inner join..
@KNU The w3fools should give credit from where they have taken the idea for the pictures. See A visualization of SQL joins by Jeff Atwood (yes, the one who co-authored SO) and the linked article by Ligaya Turmelle where Jeff got the idea and explanded it. @avi left and right joins are similar, if you are not bothered which is the primary table the join is based on. @hitesh141 It can be taken as a definition, but it's nevertheless a fact. How you happen to define something doesn't change what it is. This definition/fact is relevant to your question given the diagram. CROSS JOIN is a special case of INNER JOIN; for x LEFT JOIN y ON 1=1 the "INNER JOIN" intersection is rows in x CROSS JOIN y. The diagram set only ilustrates the difference between (what rows are returned by) INNER vs OUTER JOIN ON, it doesn't illustrate the difference between (what rows are returned by) CROSS JOIN vs INNER JOIN ON. Which by the way is CROSS JOIN = INNER JOIN with ON 1=1. PS 1 These diagrams are perfectly "accurate" when the cirlces are taken to be the sets of row values or row instances returned by the indicated operators for given input and ON condition. PS 2 My definition/fact is consistent with 'start with cross join and then "build" inner join on top of it': conceptually we can describe INNER JOIN ON as doing a CROSS JOIN then keeping rows that satisfy the ON; if all are satisfied, ie the ON condition IS TRUE, then all are kept. Did you read the link? These pictures seem to imply that union is same as full outer join and intersection is same as inner join which is not correct as far as I know. @DevDave, because contrary to popular belief - a picture is not worth a thousand words. See next answer. @DevDave Read my comments re what the diagrams actually illustrate. Re outer & inner joins--table1/2 circles encircle rows returned by left/right join respectively; full join = left join union right join & inner join = left join intersect right join. Re cross vs inner join--nothing. Google my comments re misuse of Venn diagrams for joins on other questions & answers. Two-circle cross join diagrams of other answer(s) are interpreted differently & are typically nonsense. @ypercubeᵀᴹ It's w3schools; w3fools is a now-defunct website that is unassociated with w3schools. Also, while the idea may have been an unoriginal one, these images themselves were ripped directly from W3schools, so they should be attributed as such. @TylerH the images may be from w3schools. The idea however is stolen from a different site (and I really mean stolen because I don't see any attribution in their site.) I am seriously asking: is it good to give attributions to a site that doesn't give the same attributions where it should? As for the "w34fools" reference, I shouldn't need to comment. @ypercubeᵀᴹ The idea of venn diagrams is not available for copyright so attribution for the notion of creating venn diagrams for SQL is not required. However, the copying of someone's actual image is. And as for the w3fools reference, I agree, you shouldn't have commented on it. If you bothered to visit the site you'd see why. When I say "w3fools" I mean the "w3schools" site, so I don't see your point there. About the images, I went just now and visited their site. They have a strrict policy that all images should not be rediributed or reused without permission. So the question is not if we add attributions but whether we use or not. I suppose I should flag the answer to be deleted. @ypercubeᵀᴹ w3fools is a separate website, like I said, not associated with w3schools. Name calling is already inappropriate for the site, and confusing two different websites while doing so is double problematic. As for flagging the answer, feel free; there are plenty of others with similar diagrams that don't have the same potential attribution or copyright problems. They (ab)use Venn diagrams, which are an inaccurate tool for visualising joins (they're much better for unions). I've recently written an article on the topic: A Probably Incomplete, Comprehensive Guide to the Many Different Ways to JOIN Tables in SQL, which I'll summarise here. An INNER JOIN is just a filtered CROSS JOIN where the filter predicate is called Theta in relational algebra. Note that the keyword INNER is optional (except in MS Access). This combines all actors with their films. The USING() syntax allows for specifying a column that must be present on either side of a JOIN operation's tables and creates an equality predicate on those two columns. Other answers have listed this "JOIN type" separately, but that doesn't make sense. It's just a syntax sugar form for equi JOIN, which is a special case of Theta-JOIN or INNER JOIN. NATURAL JOIN simply collects all columns that are common to both tables being joined and joins USING() those columns. Which is hardly ever useful, because of accidental matches (like LAST_UPDATE columns in the Sakila database). No one wants to write the latter, so we write OUTER JOIN (which is usually better optimised by databases). Like INNER, the keyword OUTER is optional, here. LEFT [ OUTER ] JOIN: The left table of the JOIN expression is added to the union as shown above. RIGHT [ OUTER ] JOIN: The right table of the JOIN expression is added to the union as shown above. FULL [ OUTER ] JOIN: Both tables of the JOIN expression are added to the union as shown above. Having said so, don't use this syntax. I just list this here so you can recognise it from old blog posts / legacy code. The point here is that all rows from the partitioned side of the join will wind up in the result regardless if the JOIN matched anything on the "other side of the JOIN". Long story short: This is to fill up sparse data in reports. Very useful! The WHERE a.actor_id = fa.actor_id predicate acts as the semi join predicate. If you don't believe it, check out execution plans, e.g. in Oracle. You'll see that the database executes a SEMI JOIN operation, not the EXISTS() predicate. I think the historic reason is performance. WHERE fa.actor_id = a.actor_id -- JOIN predicate with the outer query! This is only really implemented by Oracle and Informix (to my knowledge), but it can be emulated in PostgreSQL using arrays and/or XML and in SQL Server using XML. As you have seen, there are more types of JOIN than just the "boring" INNER, OUTER, and CROSS JOIN that are usually mentioned. More details in my article. And please, stop using Venn diagrams to illustrate them. Equijoin is the special case of theta-join where theta is equality. Theta-join is analogous to a special case of inner join where the on is a theta comparison on of a column from each. Some decades after Codd defined them some textbook(s) misdefined theta join as a generalization that is the analogue of inner join.